Whether you ’re new to the coaching game or a seasoned professional, your business can benefit from taking steps to optimize workflows, build your brand, and increase revenue. Here are 10 ideas to “kickstart” your endurance coaching business. 1. Set up varying levels of service. Some clients want very detailed plans while others are simply looking for a guide. To attract more athletes you should have at least two levels of service. Many coaches start with a base of $100 to $150 dollars a month, then have a second tier at $200 a month or more. This covers a solid range of most athletes’ budgets. On your website, describe the differences in the levels of service to make it clear to a prospective athlete. 2. Establish and communicate your billing methods. Will athletes be able to pay electronically? Do you invoice them monthly? What about writing checks? How many days do they have past due before services will no longer be rendered? Give your athletes clear instructions on how payments are made. It doesn’t have to be fancy, but create a site that highlights what you can do for your clients. Include your certifications and licenses, pricing levels and testimonials if you have them. You should also have a way for people to contact you directly from the site. If you’re not tech-savvy consider doing a trade: offer your services in exchange for setting up a website. A site can also be a tool for engaging and retaining current clients. If you use TrainingPeaks Coach Edition to deliver your plans to your clients, you can set it up so that when a client logs out of their TrainingPeaks account, they are redirected to your site. You can also embed a TrainingPeaks login on your website – so your clients visit your site daily to update and receive their workouts. Learn more about integrating your branding into TrainingPeaks. 4 Make sure clients know your story. In your website and marketing material put your story out there. Are you a former elite racer? Do you have a spouse and kids so you can relate to most age groupers? Did you overcome some major obstacle in your own racing? Set yourself apart and let prospective clients know why you are the best coach for them. 5. Sell or give away training plans. Writing training plans is a great way to reach athletes who are ready for structured training, but not yet ready to take the leap and get a coach. When they finish their plan and think, “What next?” your name will be on their mind. Consider short-term plans like an off-season base plan or event-specific plans. On TrainingPeaks, you can write web-based training plans and sell them in our plans store, or price them for free and offer them on your website. 6. Get your name in various directories. There are several sites that offer coach directories for athletes looking for a coach. In addition to USAT’s coach directory, TrainingPeaks has a Public Coach Directory that athletes can search to find the right coach. For coaches that qualify, TrainingPeaks can also accredit you to participate in our free Coach Matching Service. 7. Get in the public eye. Can you run a clinic through a local run, bike or triathlon store? What about writing articles for various publications? Put up a flyer at local shops or even the local recreation center. Marketing doesn’t have to mean placing expensive ads. Is there enough interest in your area to set up a group that trains at the same time every week? You can charge for this or make it free, but the key is to get in front of athletes and position yourself as the local expert. Group workouts can take time to set up, but they can create many leads down the road. Use technology to make organizing groups easier. Within TrainingPeaks, the Dynamic Plans feature allows you to set a single schedule for multiple athletes. 9. Turn your athletes into your ambassadors. Have a team kit that features your logo and either sell it at a discount to athletes or provide it with the cost of coaching. Get your logo and the logos of your partners out in the public. The goal is that when your athletes interact with others they will talk about your great services. You should also ask current athletes to refer you to their friends. You may even offer a “finders fee” (or a month off) to any athlete that brings on another paying client. If you’re at the point where you’re at your maximum client load, consider generating passive income by hiring assistant coaches and then taking a percentage of the monthly fee. This allows you to create a larger base for your business and have more ambassadors to promote your coaching. Ready to kick-start your coaching business? 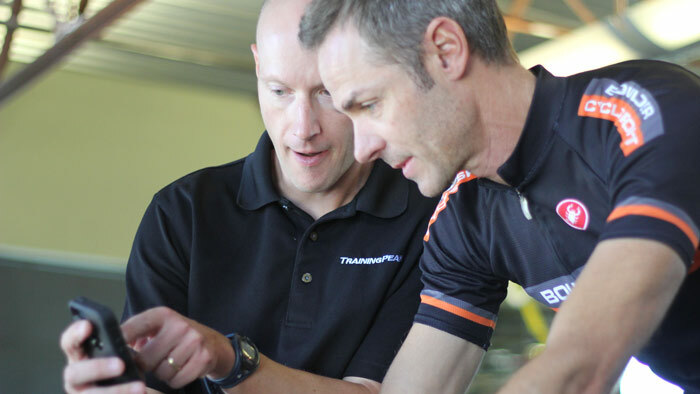 Integrate technology and science into your offering by using TrainingPeaks Coach Edition.